While Goldman has insisted that just two employees are responsible for the burgeoning 1MDB scandal, insiders said the deals were approved by committees staffed by top executives, including CFO Stephen Scherr. Goldman committees approved the doomed bond deals on the condition that bankers explain to 1MDB that it had cheaper options in raising $6.5 billion. Goldman Sachs is finding it hard to distance itself from what it says were the actions of a few bad apples. The bank has said just two employees were primarily responsible for a deepening international scandal in which Goldman bankers helped a Malaysian financier plunder billions of dollars from an investment fund called 1MDB. The two are Tim Leissner, a Goldman partner who plead guilty to U.S. bribery charges in August, and Roger Ng, a managing director who has been arrested in Malaysia. A third executive, Andrea Vella, has been put on leave. But according to current and former employees, deals as large as those that helped create the $6.5 billion 1MDB fund require scrutiny from several top firm-wide committees. The 2012 and 2013 bond transactions at the heart of 1MDB were "bought deals" that meant Goldman had to use its capital to buy newly created securities before offloading them to investors. That's riskier than in more typical arrangements where Goldman is merely distributing bonds to investors. "Anyone who's been there a long time knows you can't do big things without senior people knowing, period," said one former Goldman employee, who spoke on condition of anonymity because he still has dealings with the bank. "No matter how senior you are, there's always somebody above you. So a lot of people had to decide they were comfortable committing billions of dollars to this." In 1MDB, Goldman is undergoing its worst scandal since the financial crisis. Unlike previous controversies that stemmed from trading desks, the current issue comes from the firm's investment banking side, which gave rise to current CEO David Solomon and most of his management team. 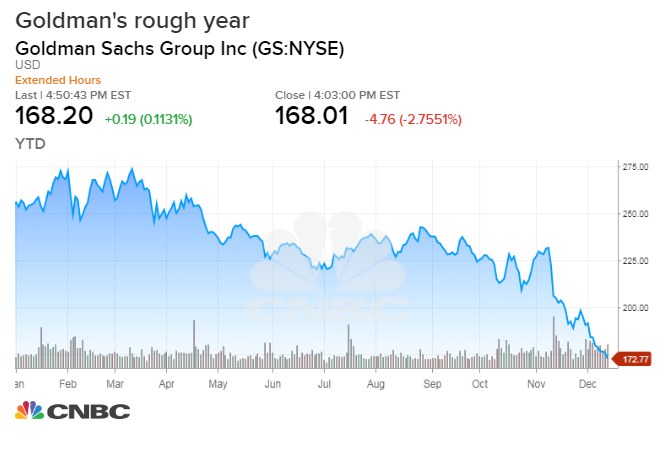 Goldman shares are down 35 percent this year, the worst performance of its big-bank peers. Its main defense has been to pin the blame on the two disgraced bankers rather than its culture or risk-management processes. Among those who approved 1MDB were Stephen Scherr, who became chief financial officer last month, according to people with knowledge of the situation and spoke on condition of anonymity. Scherr was on a group responsible for vetting large financial commitments. Solomon and his predecessor, Lloyd Blankfein, also reviewed the deals, the Financial Times reported. The Goldman committees chose to approve the 1MDB deals on the condition that the bank explain to Malaysian officials that they had other, cheaper options to raise money, according to another person with knowledge of the matter. But the client chose the pricier route because they were in a hurry, the person said. The bank ultimately reaped $600 million in fees, a higher-than-typical amount for $6.5 billion in issuance. The Goldman executives who signed off on the deals couldn't have known that Malaysian financier Low Taek Jho, known as Jho Low, would allegedly plunder billions from the fund, according to this person. Still, the bank recognized the deals could garner media and regulatory scrutiny, but Goldman ignored that and concerns about Low in pursuit of revenue, according to the Wall Street Journal. Now the firm could face 18 months to clean this mess and up to $5 billion in expenses, analyst Mike Mayo said Monday in a research note. Also, U.S. documents filed by prosecutors cite a culture at Goldman that prioritized "consummating deals" over compliance. In related documents, prosecutors said "other employees and agents" of the bank had known about bribes related to 1MDB. The bank's woes deepened Monday when Malaysia filed criminal charges against Goldman and demanded at least $3.3 billion from the bank. Goldman lied or omitted facts in its offering statements related to the 1MDB bonds, according to Malaysian authorities. The bank's shares, which have been pummeled since the U.S. Justice Department revealed in November that it was charging Leissner and Ng with bribery and money laundering, fell 2.7 percent on Monday to its lowest point in two years. In response, Goldman lashed out at Malaysia, saying that government officials and employees of 1MDB lied to Goldman about what it intended to do with the bond proceeds. Former Malaysian prime minister Najib Razak leaves the courthouse in Kuala Lumpur on December 12, 2018 after being charged in court. "Under the Malaysian legal process, the firm was not afforded an opportunity to be heard prior to the filing of these charges against certain Goldman Sachs entities, which we intend to vigorously contest," Goldman said. Regardless of where the blame lies, former and current employees — who hold large amounts of company stock and have collectively lost millions of dollars in wealth — are incensed at senior leadership for not pushing back against the doomed deal. Day by day, as Goldman shares continue to fall, they gather to commiserate over drinks or text each other stock charts showing the bank's gains from the Trump era being wiped out. "For all my friends who are still there, and the many years that I spent there, I hope people are held accountable," said the ex-banker. "They tarnished the reputation that 33,000 people took years to create."